This is a very elegant solution to the age-old problem of early drops-- if you don't draw them early enough, they lose their relevance as you get mana to cast bigger and bigger creatures. Once you hit five lands, this grows to a 5/5, then a 9/9, and so on. For a single mana, that's very impressive. The only trouble is, before you hit five lands, it's a 1/1. Just a 1/1, for one mana. It's been a long, long time since Mons' Goblin Raiders was playable. Heck, Fugitive Wizard was never playable, and that's in a color known for having weaker creatures. So oddly enough, this is one 1-mana card you'd rather topdeck in the late game than drop turn one. As any biologist will tell you, insects are the backbone of the ecosystem. And as any Magic player will tell you, insects have also been the backbone of some of the best decks throughout history: Giant Solifuge terrorized Standard for two full years, Living Hive showed countless kitchen tables fear in a single red ant, and Xantid Swarm stared down some of the most degenerate decks in Vintage. Those are big shoes to fill, but these cute little beetles just might be up to the challenge. They have green's natural affinity (no pun intended) for lands on their side, and a rate of growth unrivalled even by the likes of Tarmogoyf. There is no fear. There is no mercy. There is only the Mob. Wow. Not to often I get a card to review, and a POJO exclusive at that, that leaves me really scratching my head. This is a real unusual card. Can't beat the CC. Now, this little bug must live a round beyond it's casting. However, once it does, it is away from burn range and makes for a nice beatstick. Two rounds go by and Wow. One thing we know is that Mana does funky things in this set. Landfall has already been spoiled and so I would expect we are soon to see some cards that get lands out quicker. If that occurs, this could be a real hot card. In limited, this is going to be great. Very fun in the casual room as well. Slinging counters around... this guy will give you some to sling. In multiplayer, I wonder if someone will use a crucial spell to get rid of this guy early. Chances are he may actually get to stay around for at least one round of pump. I just wish he had some form of evasion or protection. Without, the rest of the set being spoiled will establish the value of this card. I am very excited and cannot wait for Zendikar to come out. It looks to be a great set, with a alot of cool cards to play, or cast, with. I am honored to review a brand spanking new card from Zendikar. So here we go. Constructed: Just like real life insects if you give them some food, water and time, they can turn into real monsters. But lucky us we have Raid 2009, Volcanic Fallout. Minty fresh version. Limited: At first glance without knowing all of the cards in Zendikar, this looks to be a ok pick for a one drop. Depending on the availablity of removal and other stuff, this will just be a one drop to get some early beats or for chump blocking. Mid to late game the ability to get bigger each turn is going to be a real threat if there is no direct answers to it. Overall a great card with some good flavor. 1/1 that gets four +1/+1 counters if you have five or more lands at the beginning of your upkeep steps. This is a versatile little card that can be played early for pressure, but still be a late game threat making it a decent draw most of the time. It is quite vulnerable to removal, especially before your next upkeep after being played, and has no evasive ability which keeps it from being overpowered. In Constructed this can be a good support and finisher for a deck featuring Landfall or the newly revealed Oracle of Mul Daya. Not enough of the set is known yet, but I expect to see the Mob being tested out in at least a few competitive designs. For Casual a one mana that can gain power and toughness every turn is certainly a fun idea and easily worked with. The only real problem is it being a rare, but otherwise it can fit in a number of designs. To Limited this is an easy choice to pick and likely to point you towards at least splashing Green. A one mana 1/1 is generally useful in this format, destruction is more limited, and the games last longer which all benefit this card. There is absolutely no reason to pass this around in Booster Draft and I would be hard pressed to see a deck in Sealed this shouldn't be played in. However, I do advise putting some thought into when you play Scute Mob against an unknown deck. Early destruction is a big concern if dealing with a high number of creature removal and in this format you generally won't get a second chance to play this in a single game. When this hits the field you want it to stick around, so it may be a matter of playing it early against Blue before they can counter, or against an empty handed Red and five lands already in play on your field. 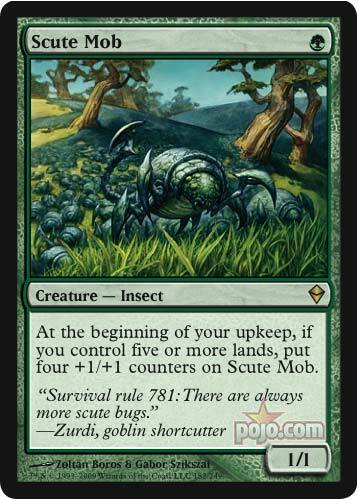 Use as a direct threat is more about skill and intuition than just brute force, but Scute Mob can also be a low cost bait to draw out a reprisal before playing a higher mana card. Your mileage may vary, but definitely play it if you get one. With Multiplayer there are more opponents and more chances for the Mob to fall before your upkeep. The added vulnerable time doesn't change the versatility, but it does make it a target whenever enough lands are in play. Welcome back readers today’s card of the day happens to be a brand new exclusive card from Zendikar. Scute Mob. An interesting creature at the beginning of your upkeep you put four +1/+1 counters on it if you control five or more lands. Now without trample or evasion of any kind regardless of how big it is it may get chump blocked, the chances of it surviving until you have five lands when you drop it early, which Is when you want to drop it. Late game it could prove to be a contender brought in to wipe up the board, topdecking this card late game is not normally a bad thing as if it survives to your next upkeep it can start swinging. In standard post rotation I don’t see a deck adopting this card it’s a generic vanilla creature albeit a big one, it can hit the board early but has no effect until later in the game. In extended and eternal formats I don’t see it making much of an impact. In casual and multiplayer it can shine it’s a big threat and most casual and multiplayer games can go for a while making this card a must deal with threat. In limited possibly if you’re in color you can nab this card I don’t know how effective it will be it has the potential to be huge but can be taken down by anyone packing removal.